Last week was one of those weeks. The kind of week that starts at 5am on Monday with a sweet little boy crying because his ear hurts. The same ear that I’ve been taking him to the doctor for now over a month that they keep telling me is fine; he’s just overly sensitive to the tube coming out because of his sensory issues. You know paranoid mother, kid with autism who couldn’t possibly know that his ear hurts. An hour or so later big sister wakes up to more asthma problems. The decision is made that she can go to school but that we’d try to get a doctor’s appointment for later in the day. Although our primary pediatrician isn’t in the office we make an appointment with our back up pediatrician. A few hours later Caden screams for me to come upstairs and I head into the family room to see blood pouring from his ear. I call the back-up pediatrician’s office back and ask if they will see Caden as well to which they agree. Fast forward throughout the afternoon as his fever inches up until it tops out around 104 with Tylenol. Arrival at the clinic was eventful. Caden was having difficulty walking so Dan dropped us all off at the door. I asked the volunteer for a wheelchair. You know one of those dozen or so wheelchairs that they keep inside the clinic door for patient use? Apparently she saw no reason that a child should need a wheelchair and then proceeded to grill me about the service dog. There are a few questions, two to be exact, that a business can ask about a service dog: is this a service dog and what services does he/she perform? The question she went with? So what’s wrong with him [him, of course being Caden]. Weeventually got our wheelchair and service dog in the door but the whole process was ridiculous and I’m not ashamed to say that I reported it to the check in receptionist as well as the nurse. You know what they say about a mama bear, not to mention a mama bear with sick cubs. Eventually the doctor determined that Caden’s eardrum had perforated and that the tube (you know the tube that I had been asking about for weeks) had turned and was headed into the middle eardrum instead of out. Since he was so sick, the doctor gave him an antibiotic injection and put him on a course of steroids in addition to the antibiotics that he was already on for a sinus infection. Big sister’s asthma medications were adjusted with the plan of adding in steroids if the new higher dose asthma medications didn’t work. And we headed home—I didn’t even steal the wheelchair although I’m sure the volunteer was quite concerned about what I was going to do with it since a child couldn’t possibly ever need one. On Tuesday Caden and I went to see the ENT Nurse Practioner who confirmed the doctor’s opinion of Caden’s ear drum. We played the steroid/fever hallucinations game all day as well as again on Wednesday. Steroids aren’t ever a pleasant experience but neurological disorders seem to make them that much more challenging. Caden imagined conversations with us and then was upset that we didn’t remember them as well as television shows we watched in the middle of the night and then was upset that we couldn’t replay them. For a child who doesn’t register pain in the usual fashion, he has been pretty vocal about his ear hurting and even more vocal in wanting us to fix it. Because Ry’s asthma was still questionable, Dan chaperoned an out-of-state fieldtrip for her class on Thursday. I decided to try taking Caden to campus since I only have one class on Thursdays. He was his usual cute charming little self around the college girls. I was once again thankful for his ipad until his youtube video used the word boring. Remember Caden likes to repeat words over and over and over. Guess what word he decided was appropriate to randomly utter throughout my lecture—yep the word of the day was b-o-r-i-n-g. I’m sure he was only saying what my students were thinking but it still wasn’t quite the ego booster that I needed for the week. On Friday Dan was able to stay home with both kids—never to be outdone, Ryley woke up sick as well. Caden and I visited the pediatrician again Friday afternoon but really didn’t get any new ideas so we’ll be stalking the ENT’s office for an appointment this week. Illness isn’t ever an easy thing to watch as a parent. Illness plus autism though always means regression in our household. The last few days have been a downward spiral of loss of words and increasing frustration—some of which will [hopefully] disappear as we conclude the steroids. I’m concerned that we will be facing surgery in the next few weeks which will be Caden’s third surgery in 4 or 5 months and he may be facing some [hopefully] temporary hearing loss. Sometimes you wonder how much a little boy can handle or how many challenges the universe plans to throw at him. I’m sure I’d be curled up in a corner somewhere by now but Caden just handles it like Caden. He keeps swallowing the medications we give him no matter how many there are, tries really hard to take it easy, and really only asks if he can have a new ipad game every 2 or 3 minutes. He’s trying really hard to be a good listener—a fact that was proven tonight when he wanted to sit beside his sister but the infamous cat Henry Pickles was sitting there. She told him to just kick Henry Pickles out of the way—thankfully Henry Pickles has a hard head and dad was quick to intervene before Ry remembered that her baby brother is quite literal. 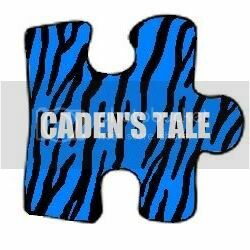 What can I say—it’s all just another week in Caden’s tale. Arrival at the clinic was eventful. Caden was having difficulty walking so Dan dropped us all off at the door. I asked the volunteer for a wheelchair. You know one of those dozen or so wheelchairs that they keep inside the clinic door for patient use? Apparently she saw no reason that a child should need a wheelchair and then proceeded to grill me about the service dog. There are a few questions, two to be exact, that a business can ask about a service dog: is this a service dog and what services does he/she perform? The question she went with? So what’s wrong with him [him, of course being Caden]. We eventually got our wheelchair and service dog in the door but the whole process was ridiculous and I’m not ashamed to say that I reported it to the check in receptionist as well as the nurse. You know what they say about a mama bear, not to mention a mama bear with sick cubs. The other day Caden asked what would happen if he didn’t learn to read. What he really wanted to know was what would happen if he didn’t ever get to move on to first grade. See, Caden needed a reason as to why he didn’t move on last year like his friends did, and we told him that he just wasn’t ready for first grade yet because he still needed to learn how to read. We had hoped that he wouldn’t really be aware of the fact he was repeating kindergarten again or that he wouldn’t care but we were horribly wrong on both accounts. I think part of the reason is because every single child he played with last year moved on and the part is explained through his affinity for numbers/order/patterns and knowing it was kindergarten then first grade. We’re three weeks into the school year and he hasn’t accepted being in Children’s House any better than he did last year when he didn’t bridge. He has become the special classroom helper and almost obsessively turned his attention to making sure the classroom stays organized and neat to the point nap mats are organized by color and style every….single….day. We can’t leave school at the end of the day until he is satisfied with the classroom. Unfortunately he hasn’t had many opportunities to make new friends to play with because Children’s House is young this year with more 3 year old preschoolers than 5 or 6 year old kindergartners. He’ll be back with his friends again next year because E1 is 1st-2nd-3rd grades combined but that doesn’t do a darn thing for this year at least in his mind. Don’t get me wrong, he is learning a lot and the decision to remain in kinder another year was the right one. He is working on multiplication and is quite the math whiz. We are closer to knowing most of the letters of the alphabet and he can tell you more of their sounds than their names but that is progress. He can even sound out letter combinations and make words by combining letters with a base like “at.” More importantly I think he is starting to understand that letters make words. But some days I wonder if Caden understanding that he is different makes the road harder for him. He now knows that people can’t understand him talking (particularly if they aren’t familiar with Caden-speak) and that makes him self-conscious to the point sometimes he won’t use words at all. The other day he didn’t think his buddy understood him at Miracle League baseball so he started using a grunt with his tongue in or a grunt with his tongue out to mean yes/no. How hard must it be to know that people can’t understand you even though you are trying your hardest to use your words? He knows that not everyone uses chewies at school so he’s stopped accepting his but the anxiety that made it necessary is still there so instead he picks his lips until they bleed. He watches baseball every night on television and knows his version isn’t quite the same but at the same time no matter how great his skills are, he can’t mentally handle the competition and chaos that a “normal” game entails. This list goes on and on but the point remains the same—he knows he is different but doesn’t have the understanding to realize that being different is okay. All he knows right is that being different often means the kids on the playground don’t want to play with you, that it is easier to just not talk to strangers, and that somehow he just didn’t get whatever it was that he needed to go to the next grade like his friends. So that question the other day was about so much more than just reading for both him and for me. Ironically for both of us it was a reference to the future and a question about being accepted and about being like others. I could give you the standard mom speech about how being unique and standing out in the crowd is so much better than being a lemming but to be honest don’t we all want to fit in. All I could say through my tears [question to the universe…why does he always want to ask world weight type of questions when I am driving?] is that if he can’t read next year I promise with all my heart that I will figure out a way to homeschool him and that I will find a way for him to learn to read. And of course in that promise for both of us was so much more. I won’t break my promise to my baby boy but now I am left wondering what promises I won’t be able to make in the future. That’s a thought that will probably keep me awake for many nights to come. Elf is an absolutely amazing, smart, intuitive, well trained, loyal, and loveable super service dog BUT at the end of the day he is still a dog. He’s not a babysitter nor is he a substitute parent for Caden. We have a fenced yard in small town USA—seriously the police report is printed in our newspaper that comes out once a week if that tells you anything about our “crime rate.” Despite our nonexistent crime rate though, Caden and Elf never play outside without someone else outside with them. Elf is tremendously loyal to Caden but without anyone there to give him commands, I have no doubt he would follow Caden on whatever adventure Caden took him on outside of the gate. Service dogs also can’t be possessive—a possessive dog is a potentially dangerous dog in public—so Elf wouldn’t have a clue how to protect Caden from abduction. Quite frankly that just isn’t his job. Same goes in the house. Elf isn’t going to get up with Caden in the middle of the night or in the morning so that we can sleep in. As tempting as that might be, Elf’s job is to alert us that Caden is leaving and then it is ourjob to do the parenting while Elf goes back to sleep. Parenting just isn’t a part of Elf’s job description either. Elf is trained to do several very important things for Caden and our family. First he is trained to track Caden. He’s our very own search and rescue dog. He knows Caden’s scent and that hotdogs and the tennis ball are waiting for him once he finds his boy. He’s always ready for the “Where’s your boy? Where’s your boy? Track!” command. Just because he’s trained to find Caden though doesn’t mean that we tempt fate. We still secure our doors and gates and are going to be signing Caden up for Project Lifesaver in the upcoming week. Elf is an invaluable resource but he’s not our only resource. Elf is trained to tether Caden. This is just a fancy way of saying that we can connect Caden and Elf with a specially designed leash and as long as one of us is handling Elf, Caden can’t get away from us. Elf is essentially trained to play stubborn dog that isn’t going anywhere if Caden tries to go in another direction. This has totally transformed our public outings and we’ve been able to more comfortably go to the mall, to amusement areas, and even sporting events because we know that we have an additional support system in place to helpus keep Caden safe. Finally Elf has been trained in behavior disruption. He has a whole host of commands that help break a repetitive cycle or disrupt a meltdown. These commands include kisses, over which provides deep sensory input, and paw. This is one of those behaviors that has evolved over time. Because Caden and Elf spend all of their time together, after a few initial months of “marking” (us pointing out behaviors to Elf and giving him one of the behavior disruption commands) Elf now recognizes certain behaviors as ones that he is supposed to act upon. This is the COOLEST thing ever. Caden can be on a crowded playground and Elf is able to pick out his cry over all of the other children. This same bond is also what makes Elf anxious when Caden is out of his sight—Elf doesn’t understand the concept of danger but he does know that he and his boy are supposed to be together. Unexpected bonuses of a super service dog for Caden have been decreasing anxiety, increasing ability to handle transitions and open spaces like parking lots, the [occasional] ability to sleep in his own room, and social interactions. Let’s face it; Caden is one of the most popular kids in his school because you can’t pet the dog, unless you ask Caden first. Words can’t explain how amazing it is to have children want to interact with a child who isn’t able to initiate interactions on his own. I also love to watch Caden caress Elf’s ears when he is nervous or getting ready for “needle” day (aka infusion days). Having Elf present during therapies and work sessions has helped Caden focus more—most likely because he has a constant with him. Elf has made every penny of fundraising 100% worth it. He makes every bag of premium dog food, every vet bill for vaccines, heartworm medications, and flea prevention as well as grooming bills totally and completely worth it. It isn’t an understatement to say that he has changed our life. But at the end of the day he is still just a dog and isn’t a substitute for anything or anyone. Think of it this way: most people don’t stop locking their doors just because they get a home security system. Same thing here: we didn’t stop parenting just because we got a service dog. Elf is another ally in our quest to allow Caden to just be a kid. At the end of the day he might just be a dog but to us he’s Caden’s super service doggy angel; to a little boy with autism he’s the best friend a boy could ever dream of. So is it a tale of a boy and his best friend or a tale of a dog and his boy? I’ll leave that one for you to decide.